Whenever I get off the road from a day of driving my RV, I like to get out for a walk. Refresh the spirit, breathe the crisp, cool air; a nice way to wind down. Today, I am in luck as I am stopped for the night at TanBark Camp in Dickson, Tennessee, just south of Nashville and the Grand Ole Opry. 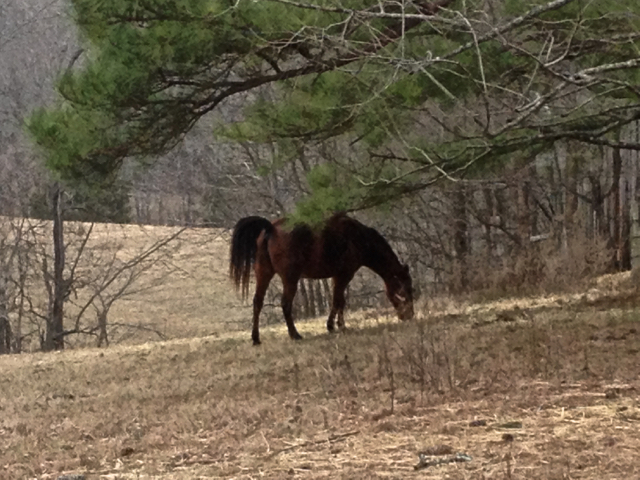 Right outside my door is a fenced-in horse pasture (horse included) with a meadow to walk in just alongside. The temperature is 57 degrees. But even more delightful is the sound of robins in the surrounding trees. I have always associated the chirping of robins as a sign of spring, a sign of awakening. What a nice, peaceful respite while winding down the day. A walk in a Tennessee meadow with a joyful sound of robins…. Yes, and a horse, don’t forget the horse. He is a beauty. I love rearing the robins. Can’t wait for them to come back to PA. Safe travels Annie. We just went on a trip to Yuma, AZ. My husband made me drive the motor home a lot. I am not happy driving it a lot. I don’t see how you do it by yourself. It hurts my back after 2 hours. I love your pictures. Ahhhhh, could anything be better than a meadow, a horse, and birds chirping? What a perfect moment. I can feel the peace.